Pundra was an early Iron Age kingdom in India (forming parts of West Bengal, Bangladesh, and Bihar for the most part). Also known as Paundra or Paundraya, it was ruled by one of five originally non-Vedic royal houses, along with Anga, Kalinga, Suhma, and Vanga. They were all descended from King Vali, according to the Mahabharata, who himself may have been the king of Magadha. Like the other kingdoms, Pundra gained a mixed non-Vedic and Indo-Aryan heritage. It seems that they abandoned their Bramhanical customs after some time and were considered to be Mlechas (non-Aryans). The Mahabharata describes the Pundra kingdom fighting on the side of the Kauravas against the Pandavas at the Battle of Kurukshetra. King Pandu of Hastinapura (father of the Pandavas) subsequently subdued the kingdom in battle, as did his son Bhima, and it became a vassal to his brother, King Yudhistira. 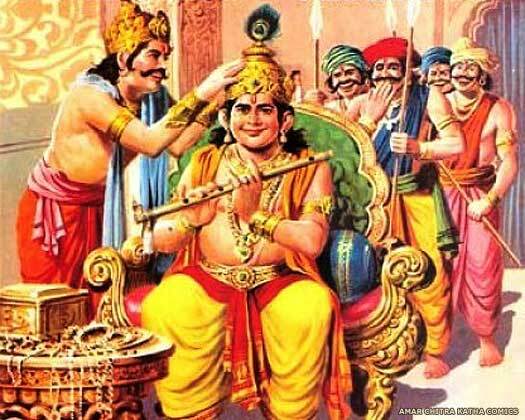 The kingdom is also mentioned in the Mahabharata as having a King Paundraka Vasudeva who apparently imitated Lord Vasudeva Krishna of Dwarka. Paundraka was also an ally of King Jarasandha of Magadha, an arch rival of Lord Krishna. As a result, Vasudeva Krishna slew him. King of Pundra and the Kiratas. Killed by Vasudeva Krishna. One of the contemporaries of Jarasandha of the Brhadratha dynasty of Magadha is Jayatsena of Magadha. Jayatsena takes part in the Kurukshetra War in the Mahabharata as one of the leaders on the side of Kauravas, along with Srutayus of Kalinga, Paundraka Vasudeva of Pundra, Karna of Anga, and Malayadwaja of the Pandyas. Bhagadatta of the Naraka kings is also involved in the war. King Pandu of Hastinapura (father of the Pandavas) subdues Pundra in battle, as does his son Bhima, thanks to the role it had played in the Kurukshetra War. It becomes a vassal to Pandu's brother, King Yudhistira, and subsequently disappears from mythology. The territory that formed mythological Pundra emerges as parts of Bihar and West Bengal, modern Bangladesh.